Although over 50 million Americans claim German ancestry, which makes them the largest single ethnic group in the United States, only around 1.38 million people in the United States speak German. It is the second most spoken language in North Dakota. In 16 states, it is the most spoken language other than English and Spanish. An extensive campaign forbad all things German, such as performing the music of German composers at symphony concerts. Language was the focus of legislation at state and local levels. 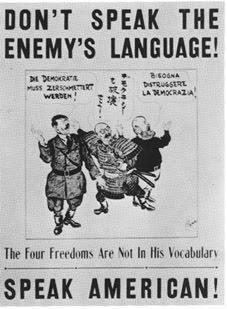 It took many forms, from requiring associations to have charters written in English to banning speaking German within city limits. Some states banned the teaching of all foreign languages, though most only banned German. A bill was introduced in October 1918 to create a national Department of Education, intended to restrict federal funds to states that enforced English-only education. The Lutheran Church was divided by an internal battle over conducting services and religious instruction in German. On April 9, 1919, Nebraska enacted a statute called "An act relating to the teaching of foreign languages in the state of Nebraska," commonly known as the Siman Act. It provided that "No person, individually or as a teacher, shall, in any private, denominational, parochial or public school, teach any subject to any person in any language other than the English language." It forbade foreign instruction to children who had not completed the eighth grade. A total ban on teaching German in both public and private schools was imposed for a time in Ohio, Iowa and Nebraska. The Supreme Court case in Meyer v. Nebraska ruled that these laws were unconstitutional, but German never recovered its position as the second language in the United States. The Amish and other Pennsylvania Germans speak a dialect of German known as Pennsylvania German (also called Pennsylvania Dutch, where Dutch is used in its archaic sense, thus not limited to Dutch but including all variants of German). It is a remnant of what was once a much larger German-speaking area in eastern Pennsylvania. Most of the "Pennsylvania Dutch" originate from the Palatinate area of Germany and their language is based on the dialect of that region. ^ "Appendix Table 2. Languages Spoken at Home: 1980, 1990, 2000, and 2007.". ^ "Detailed Language Spoken at Home and Ability to Speak English for Persons 5 Years and Over --50 Languages with Greatest Number of Speakers: United States 1990". ^ "Language Spoken at Home: 2000". 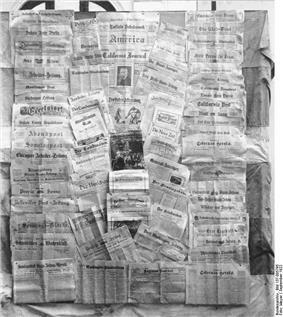 ^ "Mother Tongue of the Foreign-Born Population: 1910 to 1940, 1960, and 1970". ^ "The War on German Language and Culture, 1917-1925 by Paul Finkelman :: SSRN". Papers.ssrn.com. 2009-11-17. Retrieved 2013-11-08. ^ "Table 5.Detailed List of Languages Spoken at Home for the Population 5 Years and Over by State: 2000". ^ "Some states mandated English as the exclusive language of instruction in the public schools, while Pennsylvania and Ohio in 1839 were first in allowing German as an official alternative, even requiring it on parental demand". Ulib.iupui.edu. Retrieved 2013-11-08. ^ Dillon, Sam (20 January 2010). "Foreign Languages Fade in Class — Except Chinese". ^ Modern Language Association, 2007-11-13, New MLA Survey Shows Significant Increases in Foreign Language Study at U.S. Colleges and Universities. Retrieved 2008-05-16. Kloss, Heinz (1998) . The American Bilingual Tradition (reprint ed.). McHenry, IL: Center for Applied Linguistics and Delta Systems.